Book from Tai-Sophia co-founder Robert Duggan focuses on "Reducing Health-Care Costs in Corporate America"
The Consortium of Academic Health Centers for Integrative Medicine (CAHCIM) sent a July 6, 2012 newsletter to members in support of "the historic Supreme Court ruling upholding the Affordable Care Act" and which "expands health care coverage to millions of Americans." The notice shared that one reason for the support is that "the Act provides third party payer coverage for any health professional licensed in a given state." (Section 2706, Non-Discrimination in Health Care, would require inclusion of licensed complementary and alternative healthcare professionals in coverage schemes.) The CAHCIM newsletter also shared that the vision of the Consortium is aligned with the law's expansion of "the reach of innovative preventive and treatment approaches designed to help Americans achieve better health through integrated approaches that promote healing and health in every individual and community." Other positive features in the A.C.A. singled out by CAHCIM are the assurance that insurance plans "cover a range of preventive services, without cost sharing." They further single out the establishment of the Prevention and Public Health Fund "that supports Community Transformation Grants thereby strengthening the capacity of communities to implement prevention approaches that match the specific needs of their own citizens." The note concludes: "CAHCIM is pleased to join such organizations as Trust for America's Health, the Robert Wood Johnson Foundation, the American Public Health Association, the Society of Behavioral Medicine, and the American Association of Medical Colleges in celebrating this important decision." Comment: Section 2706 was a priority of both the Integrated Healthcare Policy Consortium and of the American Chiropractic Association. The support is particularly commendable given the formal resolution the House of Delegates of the American Medical Association has passed against 2706 and in favor of continuing with the existing prejudice and discrimination. (See Battle On: MD Specialists Promote Repeal of Non-Discrimination Vs Integrative Practitioners, Others.) CAHCIM's statement adds muscle to the CAHCIM definition of integrative medicine as an interprofessional approach in which optimal care includes all appropriate "health professionals and disciplines." Hard to include them if they are not covered. Good for CAHCIM! Michael McGuffin, executive director of the American Herbal Products Association met on July 13, 2012 with the staff of US Senator Richard Durbin (D-Ill) regarding his perspectives on the response of the herbal and broader dietary supplements industry to the recently implemented current good manufacturing practices (cGMP). The meeting grew out of a July 6, 2012 letter from Durbin and Richard Blumenthal (D-CT) in which they expressed concern with what they considered the high level of warning letters issues to inspected herbal products firms firms. According to the AHPA note, McGuffin told Durbin's staff that such levels are not surprising in any industry when new regulations come out. One example: just 54 percent of seafood companies were in compliance with a new manufacturing rule issued for that industry five years after it was established. AHPA, which Durbin has called upon to use its bully-pulpit to bring its members in line, pointed out that it has been attempting to do so. The industry organization has "included numerous publications and educational seminars (see the 'cGMP Compliance Series' at the AHPA online bookstore) and an ongoing process for distribution of FDA's warning letters to member companies." Comment: I found the seafood example interesting, and wonder if there are others. Industry compliance with new government regulations is not only frequently resisted with a knee-jerk, it is also often challenging. A tendency in any adversarial environment, such as that in which the herbal industry works, is to single out the negative in the adversary rather than to see its shortcomings as a common. Good for AHPA to engage the dialogue, and now step up its compliance-related services to its members. The MAMA Campaign to get full inclusion of direct-entry midwives as covered providers under Medicaid has announced 3 new sponsors. The three are Eleanor Holmes Norton (D-DC), Anna Eshoo (D-CA-14th), and Debbie Wasserman-Schultz (D-FL-20th). The bill is H.R. 1054, the Access to Certified Professional Midwives Act of 2011. In a message to members and donors, the Campaign also celebrated the upholding of the Affordable Care Act by the U.S. Supreme Court. The act includes a provision in Section 2301 that allows coverage of CPMs in birth centers. Comment: The Campaign has yet to find a single Republican member of Congress who will break ranks and vote in favor of this remarkable example of human-centered health reform. See Homebirth Midwives and the Hospital Goliath. Here's hoping the Republicans (and particularly the Republican women co-sponsors the MAMA Campaign hopes to sign on) will stop putting partisan politics above a woman's and family's right to choose a birth at home, particularly given the good policy sense in this act. The headline in the July 27, 2012 Baltimore Business Journal article was University of Maryland center set to jump on wellness train. The writer notes a transition at the University of Maryland Center for Integrative Medicine (CIM) from "tailoring its research on alternative medicine to academics" to "expanding its scope to shop its expertise to businesses caught up in the corporate wellness craze." According to the article, the Center's programs will focus on "developing stress management and corporate wellness programs to address a market demand among businesses and community groups for wellness strategies." The author reports that "integrative medicine leaders at the University of Maryland Center and others in their industry say they are well-positioned for this field because holistic and alternative medicine largely focuses on preventive and wellness measures." Comment: The integrative health-corporate wellness connection is something promoted in the Integrator in a big way since its hard-copy form 14 years ago. My wake-up was seeing the gross financial misalignment between mainstream health care delivery and the promise of "complementary and alternative medicine" practitioners and therapies to reduce the provision of conventional health testing and services. This financial misalignment was a factor in early integrative medicine clinic failures. What hospital CFO was going to push system resources behind services that would rob a more lucrative Peter to guarantee the relative revenue trickle from an integrative Paul? Sean Sullivan, JD, the founding director of the National Business Coalition on Health and now CEO of the Institute for Health and Productivity Management, captured the important of this shift in focus from health system integration to integration into employer programs for me. In a 1999 Integrator interview, Sullivan suggested that "CAM" and integrative financial models might look best if integration was "approached from the demand side." The big money in integrative medicine is in saving money for payers: employers, government agencies and users. Operators of integrative centers will find more potential for economic alignment via partnerships with the corporate world. As obvious as this is, with the pain of lost business on the health system side and potential for cost savings on the employer side, almost no academic integrative medicine leaders have steered their initiatives toward this harbor. The exception is the Corporate Health Improvement Program founded by Ken Pelletier, PhD, MD (hc) and with which CIM founder Brian Berman, MD has been affiliated. Good to see the U Maryland team engaging this relationship in earnest. what it means to be healthy." It adds: "Only by shifting the focus of health-care dollars from disease management to empowering individual wellness can costs be reduced effectively while expanding the quality of healthcare - and life." Duggan brings 40 years of leadership in integrative health to this book." It is published by Wisdom Well Press and available as an e-book via Amazon.com. Comment: Duggan and I met in 1995 after the NIH Office of Alternative Medicine director Wayne Jonas, MD contracted with me to prepare a paper on operational issues relative to "CAM" integration and ask Duggan to be on a discussant panel. I focused on management models with insurers, Duggan on the bigger wellness picture. He has steadfastly adhered to this view, distinguishing Tai Sophia as an "academic wellness institution." Duggan has particularly upset members of the acupuncture and Oriental medicine field who push for higher professional and medical/doctoral status when he has suggested, with tongue only partly in cheek, that acupuncturists, at their health and wellness best, should be regulated through Parks and Recreation rather than as health care/medical providers. Duggan, a mentee of Medical Nemisis author Ivan Illich, has for years brought a radical wellness corrective push to the disease management drift of the integration dialogue. Observing as he has the movement toward the dominant school's reactivity, despite prevention and health-focused principles of the integrative health fields, Duggan's perspective is a refreshing if sometimes discomforting jolt. I'd qualify my own relationship with Duggan as one filled with "dynamic tension." Breaking the Iron Triangle promises "part policy, part prescription, and all common sense." Prospective readers will be served, rather, to anticipate a book that reflects Duggan's quite uncommon sense that I have observed in our professional exchanges over this 17 years. "When I first heard about the Georgetown body mind program and the possibility of being trained as a facilitator, the whole concept resonated with me. In many medical educational institutions, OCOM being no exception, stress and burnout of students and faculty is commonplace. This program seemed to be a good antidote to that. From the initial research at Georgetown, to the experiential workshop at an IAMSE conference, to the training sessions with Adi [Haramati] and Nancy [Harazduk], this program became a good fit for our institution. Our mission statement explicitly states that we engage in "...educating highly skilled and compassionate practitioners..."
"My co-facilitator, Nancy Grotton, and I have led two groups, one consisting of ten students and one of ten faculty/staff members. The response from the participants has been overwhelmingly positive, as has the response from the greater OCOM community. There is a palpable change and excitement around the mind body work in which we are engaged. The participants' lives have clearly been touched and positively altered by their engagement with the work of increasing self awareness. I am very gratified to see such deep commitment by our institution to this project. " The three-day program, led by Georgetown University integrative medicine leaders Aviad (Adi) Haramati, PhD and Nancy Harazduk, MEd, MSW, is offered through the not-for-profit Institute for Integrative Health. The focus is on training the trainers and building mind-body programs inside educational institutions. Just 10 students are accepted at a time to the program. It has now been offered six times. Participants have come from institutions ranging from a triad in Oregon (OCOM, Oregon Health Sciences University, University of Western States (a principally chiropractic institution) to the University of Maryland, Texas College of Osteopathic Medicine and medical schools in Germany and Sweden. Joe Brimhall, DC, president of the University of Western States comments: "The mind-body training provide students with tools and practices that they can employ to improve their ability to provide effective and compassionate care. It also gives health care providers valuable modalities and procedures that they can utilize with patients to enhance health and wellness." One German participant who took the training is well-known integrative medicine leader, Claudia Witt, MD, MBA, a professor at the Institute for Social Medicine, Epidemiology and Health Economics at Charité University Medical Center in Berlin. Asked about her experience, Witt commented: "It is a great program which includes an element of reflective self-care into medical studies and supports the aim to train a generation of 'better' doctors." Witt adds that two faculty memebrs have taken the training and they have since trained 3 more. Credit Haramati, Harazduk and the Georgetown mindbody/integrative health team for taking their own research seriously and creating this program to translate it into educational practice. Credit them also for the multidisciplinary focus. One positive side-effect is that this intensive is likely a significant interprofessional experience for participants. The UCLA Center for East-West Medicine (CEWM) has announced that it is offering a new fellowship in East-West Primary Care. The fellowship is designed for medical doctors who have completed an accredited residency program in internal medicine. This two-year program is described as "a person-centered approach operating within the biopsychosocial framework with a strong emphasis on self-care to help solve clinical problems while incorporating many diagnostic approaches and therapeutic modalities originating from traditional Chinese medicine." The release notes that the program is linked to "a planned expansion (of present clinical services to) a full-service integrative health center which merges primary care seamlessly with the East-West specialty consultative clinic." The UCLA Center, led by Ka-Kit Hui, MD, presently provides roughly 13,000 patient visits each year through its clinical services. The Center already has an East West integrative medicine fellowship and a nurse practitioner fellowship. Comment: My reading of the residency support in the planned new National coordinating center for Integrative Medicine would include this among the various emerging integrative medicine residencies that may benefit through the broader coordinating initiative. This appears to be the most significant such residency the zeroes in on the East-West integration. A multidisciplinary team from the long-standing Integrative Therapies Program at Columbia University Medical Center has published Integrative Cancer Strategies for Cancer Patients. 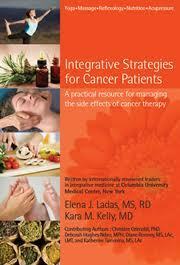 The co-authors on the book are Elena J. Ladas, MS, RD, and Kara Kelly, MD. Top integrative oncologists David Rosenthal, MD and Donald Abrams, MD, a past president of the Society for Integrative Oncology (SIO), laud the text for fulfilling on its promise to provide patients, families and practitioners quality information on "managing the side-effects of cancer therapy." Ladas is director and Kelly medical director of the program. Kelly is also incoming president of SIO. Other contributing authors are Christine Grimaldi, PhD, Deborah Hughes Ndao, MPH, Diane Rooney, MS, LAc, LMT and Katherine Taromina, MS, LAc. All proceeds from sales of the book underwrite Columbia's integrative therapies program. The book, from World Scientific press, is directly available here. Comment: While I am not a clinician and thus an inappropriate evaluator of this work from an integrative clinical perspective, my bet is that the team's long experience in delivering care infuses the book with practical know-how. These brief notes are from Google's alert function. The University Hospitals (Ohio) Connor Integrative Medicine Network center posted information about its Ahuja Medical Center's integrative psychiatry program here. The University of Arizona Center posted in formation about it's elective rotation in integrative medicine. A study of a memory supplement from Sutter Downtown Integrative Medicine in Sacramento was featured in a Georgia media outlet. Victoria Sierpina, MD posted a review of Integrative Medicine, 3rd edition by U Wisconsin IM leader David Rakel, MD on the University of Texas site with which Sierpina is affiliated. University of Pennsylvania's Myrna Brind Center for IM research director Andrew Newberg was prominently featured in a Forbes piece on how language works in corporate communications. A Parkinson's support group donated $6000 to Delaware's Beebe Medical Center's Center for Integrative Health. UCLA's Collaborative Centers for Integrative Medicine celebrated the top ranking of its ECAM peer-reviewed journal. A brief posting notes the affiliation of an integrative center at the St. Regis Saadiyat Island Resort in Abu Dhabi with the with the George Washington University Research Center in Washington, DC. The UCLA-based Simms-Mann Center for Integrative Oncology kicked off a FaceBook page with director Mary Hardy, MD featured. U Mass Medical Center features a new integrative oncology initiative led by student interest. Beverly Hospital in Danvers, Mass. is initiating an integrative pain management program. Catherine Bushnell, PhD: optimal for the job? The NIH National Center for Complementary and Alternative Medicine has appointed M. Katherine Bushnell, PhD, as the new scientific director of the Division of Intramural Research. Bushnell will lead an NIH-wide pain initiative. Bushnell is a distinguished, conventional pain researcher with multiple honors. These include Lifetime Achievement Award from the Canadian Pain Society and the Frederick Kerr Basic Science Research Award from the American Pain Society. Her interests are "forebrain mechanisms of pain processing, psychological modulation of pain, and neural alternations in chronic pain patients." An examination of Bushnell's CV finds over 100 publications and numerous awards. Nothing is directly related to complementary, alternative or integrative medicine. In a comment on the appointment, NCCAM director Josephine Briggs, MD states: "Under [Bushnell's] leadership, this program will continue to work toward the development of better ways to safely and more effectively treat chronic pain, and advance research on the intersection and integration of pharmacological and non-pharmacological approaches." Comment: One positive sign in the NCCAM's ongoing practice of hiring leaders with no direct experience with the modalities, systems and disciplines NCCAM was charged to explore is Bushnell's training as a psychologist. That's better than a straight, bench, mechanism researcher. Yet think of the missed opportunity here. Imagine the NCCAM research product if We the People had hired a health services researcher whose experience reflected work in integrative pain delivery and the patient-centered and payer interest in outcomes such as satisfaction, functionality, and cost. Why not choose someone squarely experienced in these "non-pharmacological approaches"? Instead, NCCAM appears to be serving its usual masters: mechanism and the NIH hierarchy that cares about it. NCCAM likely views this appointment as a coup to have this NIH-wide pain initiative inside the NCCAM. That's probably useful, given the assaults on NCCAM's worth from within and without. But other than that political move, would someone please share why this clearly top-flight individual belongs in NCCAM rather than somewhere else in the NIH? Bushnell seems to be hardly the best appointment to support either the IOM pain "blueprint" that promotes an integrative pain strategy or the move in research toward patient-centered outcomes. Is it too much to expect that NCCAM might actually advance research into the strengths and uniqueness of multimodality integrative treatment? In a joint release on July 16, 2012, Bastyr University and the Group Health Research Institute announced that one of the leading researchers in complementary and alternative medicine, Daniel Cherkin, PhD will become director of Bastyr University Research Institute (BURI). According to the release, Cherkin, who is currently a senior investigator for Group Health Research Institute (GHRI), will continue to have a joint appointment at GHRI. There, he will "continue his current research projects in complementary and alternative approaches to back pain." Cherkin has strong ties to Bastyr University going back to 1981, when he served as an instructor, and leading up to a co-authored study with Bastyr researchers about the positive effects integrative care can have on diabetes patients. Cherkin, a past program director of the most significant international research conference in complementary and integrative medicine, recently was appointed to a term on the NIH NCCAM. Comment: This is an exciting appointment. Cherkin has worked closely with Bastyr's growing cadre of top quality researchers like Ryan Bradley, ND, MPH and Erica Oberg, ND, MPH. The move essentially gives Bastyr two NIH NCCAM advisory council appointees, as Bastyr's dean for naturopathic medicine, Jane Guiltinan, ND, has the one slot held by a naturopathic doctor. The appointment puts Cherkin squarely between one of the top HMO research institutes and one of the two most significant CAM research centers. According to an analysis by the Academic Consortium for Complementary and Alternative Health Care, as of early 2011, Bastyr had received nearly a third of all NCCAM grants to "CAM" institutions. (See ACCAHC reports that CAM schools received just 4.6% of NCCAM's $1.29-billion between 1999-2010.) Expect good things from this move. The Canadian network for CAM research (IN-CAM) has announced winners of the 2012 Canadian CAM Research Funds grants competition. Notably, the 5 winners include 4 who are from the chiropractic and naturopathic medicine professions or institutions linked to them. Two went to researchers associated with the Ottawa Integrative Cancer Center, a project of the Canadian College of Naturopathic Medicine (CCNM): Dugald Seely, ND, MSc and Laura Weeks, PhD. Seely is undertaking an-of-1 study of homeopathic treatment of fatigue in patients receiving chemotherapy and Weeks a "Participatory, Formative Evaluation of Practitioner Integration at the Ottawa Integrative Cancer Centre." Also at CCNM,Deborah Kennedy, ND, MBA, was an awardee for a study called: The Diagnostic Predictability of Food Allergy Testing in Individuals with Irritable Bowel Syndrome (IBS): A Comparison between various laboratory methods and an elimination diet (The FAST Study). The fourth awarded study is from chiropractor Jeffrey Scholten, BSc, DC: "Moving towards evidence informed practice: Evaluating the feasibility of using online software to collect patient information for a practice based research network." Scholten's work is via the University of Calgary. The fifth award went to Cary Brown, PhD at the University of Alberta for a pilot study of self-shiatsu hand massage "as an intervention to promote sleep efficiency in persons with chronic pain." Comment: These Canadian awards are an interesting juxtaposition to the NIH NCCAM appointment immediately above. The Canadian awards in a nation where the health system has a strong socialized component at is base, are all clinically focused on the kinds of things directly meaningful to people in integrative practice. The NIH appointment into a system hell-bent on protecting its for-profit nature, remains a few orders of magnitude removed from the real world. The American Chiropractic Association sent a notice to members on July 26, 2012 underscoring the presence of doctors of chiropractic (DCs) at the London Olympics.Twenty-eight will be working at the multidisciplinary Olympic polyclinic provided by the London Organizing Committee. Nearly as many other chiropractors (27) will be present on behalf of other countries and teams from around the world. One is the team doctor for the British Virgin Islands, Angela Salcedo, an ACA delegate from Washington, DC. Another member James Parker, DC, provided services as the June trials in Eugene, Oregon. At the games, U.S. team members will have another member Joel Bienenfeld, DC on hand. The ACA's release juxtaposed these examples of integration with the year 1979, when "track and field star Dwight Stones broke barriers and thrust chiropractic care into the Olympic spotlight in an interview on national TV, where he spoke about the important work being done by Leroy Perry, DC." The House of Delegates of the American Association of Naturopathic Physicians will hold a Stakeholder and State Leadership Summit prior to the profession's August 15-19, 2012 conference in Bellevue, Washington. The topics with be: 1) Going Mainstream: What are the risks to our medicine? 2) How might the assignment of responsibilities, communication and accountability (governance structure) better reflect the values, goals and community of the American Association of Naturopathic Physicians? 3) Shall the American Association of Naturopathic Physicians pursue a strategy that includes national certification as part of ongoing licensing initiatives? One goal of the Summit will be developing resolutions for the House of Delegates meeting that will convene later that evening. Comment: I am a fan of the typically messy, democratic process represented by an active and engaged House of Delegates. Under speaker AANP's current speaker Bruce Milliman, ND, a national leader in the profession's primary care and insurance positioning, the AANP's House is emerging from a position of relative quiescence. Good to see this re-assertion from the professions bottom-up. Heather Sanders from the Society for Integrative Oncology sends an invite to "join us in celebrating this year's theme, 'Honoring Diversity in Cancer Prevention and Control'" in Albuquerque, New Mexico October 8-10, 2012. The program will "explore areas on health disparities, cancer prevention and control, nutrition, exercise and lifestyle. The SIO meeting will be co-sponsored by the University of New Mexico School of Medicine Section of Integrative Medicine and the University of New Mexico Cancer Research Treatment Center. The keynoter will be Harold P. Freeman, MD, chairman emeritus and founder of the Ralph Lauren Center for Cancer Care and Prevention in New York City. As a follow up to its inaugural IM4U conference in 2011 which drew 130 people, a second annual conference will be held in Satna Clara, California September 6-8, 2012. The featured presenters and themes will be: The Federal Framework for the Transformation of Health Care: Opportunities for IM for All (Herb Schultz, Regional Director, U.S. Dept of Health and Human Services); Integrating Natural Health Care into the Safety Net, Making Friends with CHCs (Jill Sanders, ND); Healthy Food, Healthy Communities: Transforming the Food Landscape (Jen Matthews, MD); Examining Disparities in Community Acupuncture Clinics (Kim Tippens, ND MSAOM and Maria Chao, MPA) and Whole Person Support for People Experiencing Homelessness/COTS (John Records, JD). Various pre-conference sessions will be held on the 6th. Conference information is here. Many moons ago, a review copy arrived of the soft-cover The Practitioner's Journey: The Path to Success for Holistic, Alternative and Integrative Health Professionals. The book is by the author-practitioner team of Dan Clements and Tara Gignac, ND. The book sat on my back desk until I recently gave it to a close colleague, Jeana Kimball, ND, MPH, who is about to reenter practice after 10 years away, most recently as an administrator in the University of Washington School of Medicine. Kimball had previously worked clinically for 10 years, first as a cash-based fee for service clinician, then for six years as the owner of the West Seattle Natural Medicine Clinic which then housed a multidisciplinary group of tenant (NDs, LAcs, massage, psychologist) in which she practiced as a primary care physician embedded in the mainstream payment system. Kimball reports of her experience with the book: "I am re-entering practice. The book helped me clarify and re-focus how I want to practice. Their approach is philosophically-based so it helps you your reflect on and figure out how to guide you to your own practice. It is a guide, not a cookie cutter plan. It is good read, well written and practical. It feels very authentic. They know what they are talking about." Comment: Some of you will recognized Dr. Kimball as the present author's spouse. We have in common with the Clements-Gignac team the experience of sabbatical abroad, ours described here and theirs in their prior book, Escape 101. All I can add to Jeana's review is that she has referred directly to it multiple times as we think into our next steps here. She also thought it sufficiently valuable that she loaned it out to a close colleague. A Washington Post article on July 31, 2012 was More than a luxury: massage offers physical and mental benefits painted a very positive picture of massage's value. Massage Magazine posted information on the positive view of osteopathic medical students on CAM and massage. The San Francisco Business Times reports July 27, 2012 that, FoundHealth, a social media firm is projecting $15-million in revenues by 2015 has raised $225,000 from unknown angel investors. CBS Miami ran a positive brief on sound healing with the use of a didgeridoo. According to the Martinsville Bulletin on July 24, 2012, the donor has contributed a building in Martinsville, Virginia to establish the Integrative Centers for Science and Medicine as a new medical school. It's future appears uncertain. Integrative oncology consultant and Integrator adviser Glenn Sabin posted va piece on the Affordable Care Act and integrative medicine. The US Army's Integrative Cardiac Health program at Walter Reed is featured in this US military news article. A Vancouver Sun piece explored the deep roots of Canadian integrative oncology leader Roger Rogers, MD, tracing them back to author-practitioner and natural health pioneer Frank McCoy, MD. The $250,000 Dr. Rogers Prize was named after Rogers. A Stars and Stripes feature explores the value in complementary care for veterans and returning soldiers with PTSD. Helen Erickson, PhD, RN, AHN-BC, FAAN was selected as the nurse of the year for 2012 by the American Holistic Nurses Association (AHNA) . Erickson's recent impact on the holistic nursing field is service as the immediate past-chair of the American Holistic Nurses Certification Corporation, the international credentialing body for holistic nursing. For many years she has been an anchor of the profession's move toward board certification and testing. Erickson was, according to a July 25, 2012 announcement from AHNA, previously inducted into the American Academy of Nursing as a fellow in 1996, was awarded the Faculty Teaching Award from the University of Texas at Austin, School of Nursing in 1990, was inducted into the ADARA, Women's Leadership Society at the University of Michigan in 1982, and also in 1982 received the Sigma Theta Tau (Rho Chapter) Award for Excellence in Nursing. The first chiropractic student to ever be an Albert Schweitzer Fellowship is National University of Health Science student Dana Madigan, according to this notice on the NUHS site. The note describes the Schweitzer program, which started in 1992, as "support(ing) graduate students in learning to effectively address the social factors that impact health, as well as developing lifelong leadership skills and living the famous physician-humanitarian's message of service." Madigan's project for the fellowship will be to "help deepen connections between the NUHS clinic in Lombard, Illinois, and community organizations that help the medically underserved, specifically in regard to low back pain." Madigan is committed to strengthening relations between the CAM fields and public health. She is also studying to receive her MPH via a coordinated program between NUHS and the University of Illinois at Chicago. The director of pain management of Scripts Integrative Medicine, Robert Bonakdar, MD, ABIHM, has been elected as the new president of the American Academy of Pain Management (AAPM). AAPM is the nation's largest multidisciplinary organization. Bonakdar completed a clinical and research fellowship in integrative medicine at Scripps Center for Integrative Medicine in La Jolla. He is a regular presenter on the Integrative Holistic Medical Treatment for Pain component of the American Board of Integrative Holistic Medicine. Bonakdar's experience also includes extensive study in Southeast Asia.